Hot weather combined with the physiological stress of travelling and competing can increase the risk of dehydration in horses which is likely to compromise performance and recovery. There are things you can do to reduce the risk of dehydration and improve recovery times for your horse and they don’t all involve water! As the saying goes horses are not always keen to drink, especially when away from home. Ironically, horses often prefer the water from the field tank than fresh from the tap and so if they don’t normally drink much out of the bucket in the stable, try filling it with water from the tank and if possible, take your own “tank” water with you to competitions. Another tip is to try flavouring your water at home with a little bit of cordial or food flavouring and use the same flavour when you stay away to hide the change of water. Using soaked horse feeds is another way to increase water intake that doesn’t require the horse to actually drink from a bucket. 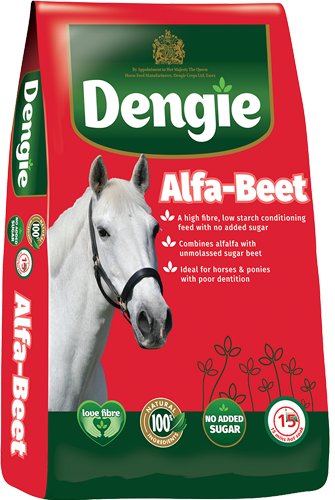 Unmolassed sugar beet or Dengie Alfa-Beet have to be soaked prior to feeding and are less than 5% sugar so suitable for most horses and ponies. The sugar beet provides a great source of highly digestible fibre that supplies fuel in a form that is ideal for horses working at lower intensities so has lots of benefits. Rising temperatures and increased activity can cause your horse or pony to sweat more resulting in the loss of electrolytes: essential salts that the body needs to function correctly. Both electrolytes and water are needed for re-hydration so adding electrolyte supplements to your horse’s water is ideal. If this puts your horse off drinking then they can be mixed in the feed, but make the feed is wet and slushy to promote efficient absorption. Horses that are competing a lot over the summer will probably spend longer periods of time in the stable or in work and so less time turned out in the paddock. Grass, which is around 80% water, normally helps to aid hydration. If hay or haylage are consumed instead of grass, water intake will drop significantly. Hay is only about 15% water and haylage typically between 30 and 50%. Soaked sugar beet such as Dengie Alfa-Beet can help to make up the shortfall. Obviously the cool-down period helps to bring the horse’s temperature and respiration rate down but it has another important function. 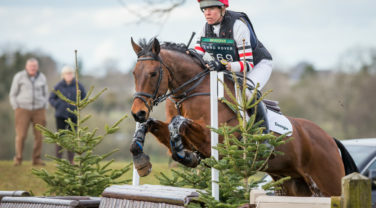 It is probably fair to say that the lymphatic system is not very well understood and yet it is crucial to the horse’s health, performance and recovery. The lymphatic system consists of an extensive network of vessels and nodes that help to maintain fluid balance and cellular health. After exercise, the lymphatic system has lots of work to do clearing the waste generated by cells that have been working hard to supply the fuel that powers performance. The flow of lymph is stimulated by things like muscle contraction, the pulse through arteries and movement of the gut (peristalsis). The cool down period is really important for allowing the waste products of exercise to be cleared by the lymph system. 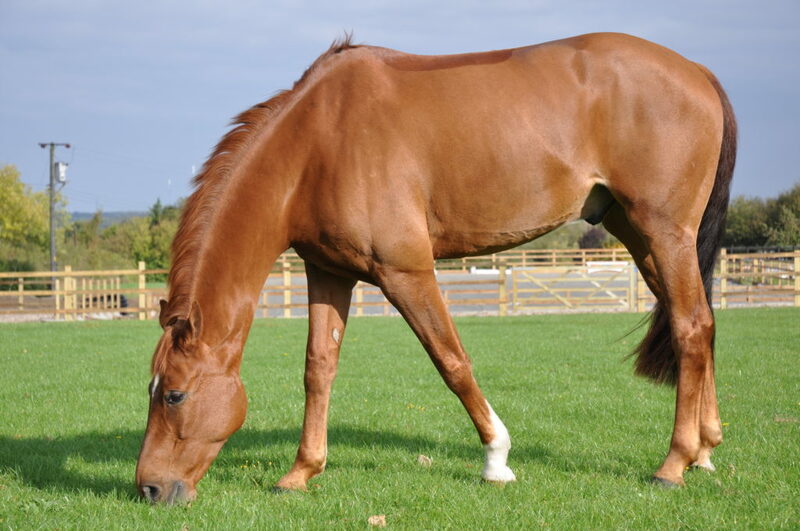 Turning a horse out after exercise is really beneficial as the horse is moving around freely and eating, both of which help to stimulate the flow of lymph. The horse has a lot of lymph nodes – 8000 compared to 600 in humans. Half of the horse’s nodes are in the colon and so will function best when plenty of peristalsis occurs. This is one of the anatomical differences between an herbivore that is designed to spend most of its time eating, and an omnivore that tends to meal feed. This is a key reason to feed competition horses plenty of fibre as it helps to “detox” the body. Awareness of the role the microbial population in the gut has on health and behaviour is increasing. The functional interaction between dietary fibre, the bugs that live in the gut and the mucus barrier that protects the gut tissue is becoming more widely researched and understood. One study carried out in mice, has shown that if insufficient fibre was supplied over the long or short term, the bugs in the gut resorted to using the mucus barrier as a nutrient source, resulting in the reduction of the defence barrier in the colon. The researchers suggested that the damage to the mucus layer potentially allows harmful bacteria greater access to the gut tissue and therefore more opportunity to cause problems. This research suggests that if the gut is made weaker and more permeable by low fibre diets then it is more vulnerable to infections which could have significant consequences for health and performance especially in horses that are travelling and coming into contact with lots of other horses and therefore potentially harmful bugs! Fibre and oil provide slow release energy which can be particularly useful for fizzy or over-excitable horses. When they get over-excited they often sweat more losing more electrolytes and wasting energy messing about. It’s not a great surprise that these are often the horses that run out of energy in the competition and run-up light afterwards. Utilising fibre and oil as energy sources and reducing starch intakes may help to reduce the risk of these problems. A study at the University of Edinburgh compared a fibre based diet that provided only 2% starch with a cereal based concentrate mix of the same energy level that contained 22% starch. Both diets provided the same amount of energy overall. The results showed that horses fed the cereal-based concentrate mix were more reactive to new situations and equipment. They were also less consistent in their behaviour and had higher resting heart rates compared to horses fed fibre-diets. The results of this study add to an increasing body of evidence to show that the key for a more focused performance is to use ‘slow-release’ energy sources such as fibre and oil. One of the other great things about using fibre and oil as energy sources is that they don’t need to be reduced when the horse has a rest day. This can really aid recovery from a competition as energy can safely be put back in when the horse is resting and recovering. 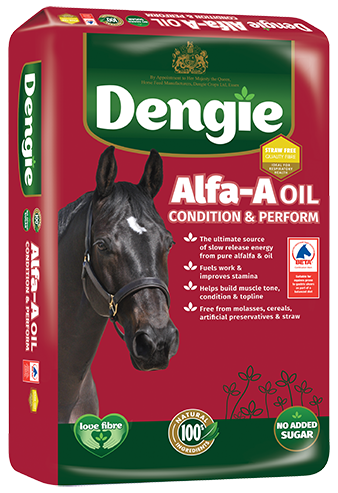 A feed combining alfalfa and oil such as Alfa-A Oil, provides as much energy as a competition or conditioning mix but with around 10 times less starch – a great way to provide energy for recovery but without the risk of digestive upsets. The performance horse relies on their lungs to provide the oxygen that enables muscles to function and energy metabolism to occur. If the lungs aren’t healthy, the supply of oxygen may simply not be as good as it could be and performance could be compromised.